← Swiss Roll Ball into Own Goal. The Algarve summer is over, and rather abruptly so. On Sunday, I was at the beach, enjoying the final days of warm and dry bliss of this long summer of ’09. The water was warm, the sun was shining and a perfect blue sky reminded me of how blessed we are, despite all our difficulties, to live in a region where bikinis and flip flops sell a lot better than umbrellas and coats. Yesterday, mild showers outside and the socks on my feet clearly stated that much has changed since the weekend. I’m a summer person. I love the hot, dry weather, the light clothes, the long days and warm nights, the beach, the sand and the sea. I love the red earth of the Algarve, under an endless blue sky. I love the smell of sardines being grilled in the open air, and the taste of the local bread, slightly sour, bringing back fond memories of family holidays in my childhood and youth. I barely survive the winter. I suffer physically from the cold, and psychologically from the dark. While the rest of the world cheerfully looks forward to Christmas, I shudder at the thought of the longest nights of the year, the coldest and wettest days, the layers of clothes that I wrap around myself to no perceptible avail. I hate socks and overcoats; I detest woollen sweaters and thick corduroy trousers. The only thing that gets me through winter is the certainty that every single day that I suffer through, brings me closer to the next summer. The case of Justice for Madeleine McCann has been one long, dark winter for almost two and a half years. No matter what each one of us thinks happened to the little girl that vanished from Praia da Luz in May 2007, what seems certain is that a crime has been committed, and it remains unsolved to this day. A child has disappeared without a trace, the world was summoned to search for her, and despite publicity from Alaska to Australia and a hefty reward being offered, absolutely no useful information about her whereabouts has emerged. None of the campaigns that her parents launched, none of the private detective teams that were hired, none of the worldwide appeals, nothing produced any results whatsoever. Neither did, according to the prosecutor who archived the case, the work of the Portuguese Polícia Judiciária. Meanwhile, on internet forums and blogs, so-called ‘pros’ and ‘antis’ brandish arguments in favour of basically two theories: abduction versus parental involvement. The child’s parents have endorsed the former; a Civil Court judge in Lisbon has practically outlawed the latter, until further notice. Those who defend the abduction theory basically rest their arguments on the apparent impossibility of two English tourists, in an unfamiliar area without a vehicle and without known local contacts, being able to make a body disappear without a trace, within a reduced time frame, and while maintaining a perfectly normal demeanour. Those who favour the theory of parental involvement, found their arguments on the apparent impossibility of someone abducting a child from within a holiday apartment, without leaving a trace of his or her presence, and in the midst of a flurry of movements to and from the apartment block, by the McCanns and their group of friends. A considerable number of unusual indications, like the dogs’ detection of cadaver and blood odour in the apartment and the parents’ hire car, inconsistencies in the witness statements, and the parents’ and their friends’ reluctance in cooperating with the police, in diligences that have the potential of clarifying many aspects of the case and eliminating them as suspects, have not contributed to make the discussion more peaceful, or the case clearer. Was Madeleine McCann abducted from apartment 5A at the Ocean Club, on the night of May 3, 2007? Let us presume that she was. Let us presume that Madeleine was taken, just like that. For a moment, let us forget about open windows, jemmied shutters, unlocked doors. Forget about the dogs, the DNA tests, the incongruous witness statements. Forget about 48 unanswered questions, men carrying children through the night, spokespeople and lawyers and image consultants. Imagine, for a moment, that all that had been reported, was that a child was safely sleeping in her bed at around 9 p.m., and that one hour later, she had vanished without a trace. If that had been the only thing that had ever been said about this, would you be more prepared to accept that Madeleine was abducted? I think that you would. It would still sound like a very strange thing to happen, an incredibly rare occurrence, especially to a child that had been in that location for only 5 days, and on holidays. However, you would set it aside as a very unfortunate case, one in a zillion, a mystery that you would probably accept would never be solved. Is she dead, is she alive? If Madeleine is alive, she is being held captive against her will. No matter how well her captor treats her, she is not where she naturally belongs. Society in general, and the authorities of two countries in particular, have a moral, not to mention a legal obligation to search for her. It is beyond incomprehensible that the Portuguese police have actively stopped investigating the possible abduction of Madeleine McCann. It is disputable whether or not the Public Ministry acted correctly in shelving the investigation of the theory of parental involvement. But it surely cannot be defended that the Public Ministry acted correctly in dropping the investigation into a potential abduction, literally abandoning a possibly suffering captive child to her misfortune. In the same manner, there should be an English law enforcement agency investigating the abduction of an English subject, especially when it has to be taken into consideration that she could have been targeted while still on British soil. The very special circumstances of Madeleine’s possible abduction have to consider the hypothesis of Portugal having contributed with nothing to this crime except the few square meters of land where it took place. Just as incomprehensible as the fact that the Portuguese authorities dropped the case as quickly as possible, is the fact that no British agency picked it up as swiftly as it could. There is, after all, a potential abduction victim being held captive and possibly subject to all sorts of abuse, day after day. The only people who seem to worry about this lack of initiative and sheer urgency, seem to be the many members of Madeleine forums and blogs, ‘pros’ and ‘antis’ strangely united in one common purpose, which is to solve the crime – because a crime has been perpetrated. The child’s parents make public appearances, now and then, stating that the public needs to remain aware that she is missing – as if we could forget – and that their daughter needs to be found. How exactly that is going to happen, by employing two private detectives with no known record of expertise in missing children’s cases, instead of getting the very best specialists from legitimate police forces on the case, is something that I, and apparently a considerable part of the public, fail to understand. Madeleine McCann, victim of abduction, alive and suffering, held captive somewhere on the same planet where my children live in happiness and freedom, needs to be rescued, and that has to happen now, not within months or years. Her parents should not have to be making plans to visit Luz, the place where they held their daughter for the last time, at some point during the coming months, alone. They should be making plans to hold her again soon, they should be making plans to return to Luz with her, next summer, to complete the holidays that were so cruelly interrupted. Because there will be a summer after the winter. Reprinted by kind permission of Astro. Hypothesis, ‘could have been’, ‘might have been’. All of them mean nothing. Let’s deal in facts here. The only thing we know as fact is that a little girl is missing. She may have been abducted,…or not. Her parents may have been involved…or not. Personally, I feel that whatever may have happened, we shall not see this poor little tot again. I know what I think…but that’s another matter. The McCann parents have behaved in a puzzling manner. Rage. Hurt. Why us? Demand return. Demand this. Demand that. Public relations campaign. 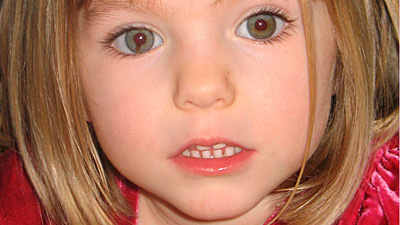 Mrs McCann’s check on daughter did not ring true. There is something vaguely unsettling about their conduct. Cannot put my finger on it. If her parents were indeed involved, they wouldn’t have continued as tirelessly or as long as they have done to try and find her. So I say they were not involved. Either she was abducted or it was a tragic accident. These English Doctors are sending elderly ladies to an early death, ramming their car in an airport, trying to poison the mother of an unwanted child, why not making disappear a more or less wanted child. As for the French lady, she keeps herself away from their services as much as possible !!! There was going to be a French broadcast tonight with both documentaries [the Portuguese “The truth about the Lie” and the English mockumentary produced by the parents] plus a discussion with Gonçalo Amaral and a confrontation between the two thesis of what has actually happened to the little girl. A two-hour transmission starting at 20:35 tonight on W9. Anna, you’re a legal eagle: is it possible to stop a FRENCH telecast and block monies in numerous countries with a Portuguese court order? It was Scarlet with the revolver in the apartment. The attitude of the protagonists depresses me. At best, we have crass stupidity, selfishness and irresponsibilty – at worst, we have cynical criminality of the worst kind. A child is missing and all the media management, t-shirts and fun-runs in the world won’t bring her back – the case should be reopened, with the full cooperation of all involved and **** the sensibilities. It’s the only way to find out the truth and achieve justice for the victim – nobody’s reputation is more important than that. When you think of it , are you inhibited ? do you want to conform ? The natural , urgent , desire is to beleive in stranger danger. You best hope for that, in this case. “The case should be reopened”? When was it closed? I have not the slightest doubt that the parents are innocent, and that Maddy is still alive. The first is a belief that has grown by the day since the incident was first reported, the second a hunch. It could have happened to any of us. We live much of our lives on a feeling of trust; complacent trust perhaps but trust nonetheless. We want our children to develop as they grow, without imprisoning them in a coccoon of protection, never learning about the real world and never becoming street-wise. That’s harder today than it’s ever been – as a child, I used to go alone to my local park to meet friends. I always got there, and I always returned, safely. I never let my own children do any such thing. It must have seemed safe to the McCanns to leave their daughter alone in a secure apartment. It wasn’t. They were desperately unlucky, and they will live the rest of their lives – or until their daughter is found – with that feeling of guilt. But they are innocent of any involvement – if they were involved, Maddy would have been found within hours. It was never “closed”, but it was formally “shelved” on July 21st, 2008 – I believe that the legal deadline for the parents to request the reopening of the investigation expired some time ago, but you’re welcome to research that yourself. Why that was not requested, of course, remains open to speculation, but congratulations on your unshakeable faith and certainty – it puts us poor, questioning heretics to shame. Madeleine wasn’t alone. The twins were there too! I don’t think they had a direct hand in the girl’s disapearance but I do wonder if their behaviour afterwards, along with that of the Portuguese police, has basically buggered up any chances of working out or even finding Madeleine. Things like having all and sundry traipsing in and out of the room, courting the media so completely to the extent of roping in the likes of Gordon Brown and others to stick their oar in. Odd behaviour on the face of it but I haven’t a clue what I would do in the same circumstances. I think it backfired to some extent – the hyperactive short attention span media and media luvvies got bored with it. It’s not beyond possibility that this case will simmer for a decade or more before a conclusion, if one is ever to come. Ben Needham still hasn’t been found. From the Police perspective they haven’t a lot to go on – it’s not like say the disappearance of Claudia Lawrence, an adult with a lifestyle that has provided Police with plenty of leads. It couldn’t have happened to any of us though. We don’t all choose to leave children dosed up and in bed, with no form of supervision even when it was available, just so we can have a night out. ‘this case will simmer for a decade or more’ – nay lad, have faith, if Madeleine is not found, in 50 years time there will be a queue of grey-haired and wrinkled would-be Madeleine’s lining up to sell their story to gullible newspapers, outdoing each other with the horrors of what they endured, offering to undertake DNA tests in an effort to claim their share of the fortune, and generally rivalling Princess Anastasia. Ooh, Anna, you wee cynic – I feel a “Spartacus” moment coming on. Adam Collyer: “If her parents were indeed involved, they wouldn’t have continued as tirelessly or as long as they have done to try and find her. So I say they were not involved. Either she was abducted or it was a tragic accident”. Flawed logic. It is precisely because they were involved that they have to continue the pretense. This is because if it isn’t abductor then it is them. What we have here is a disappearance. It makes more sense that the disappearance was arranged to cover up her death. If it was merely a tragic accident then the McCanns could have reported this. It would appear that it is the manner of death which the McCanns sought to hide from the authorities. Hence the fake break-in story and rather too convenient abductor. ………I have it on good authority that Princess Anastasia is still alive and is in fact Chieftiness on a small atoll in the Pacific ocean!!!! !